They’ll be absolutely beside themselves if their Tigers can manage just one more win over their hated Central League rivals. Mauro Gomez provided the big hit with a tiebreaking two-run single in the seventh and the bullpen made the lead stand up as the Tigers moved to the brink of winning the Central League Climax Series Final Stage with a 4-2 victory over the Yomiuri Giants in front of a crowd of 46,025 on Friday night at Tokyo Dome. The Tigers lead the series 3-1 and can advance to the Japan Series for the first time since 2005 with a win in Game 4 on Saturday. Gomez, who this year drove in 109 runs to win the RBI title in his first NPB season, had three RBIs in Game 3 and has six in the series. The Tigers’ Nos. 1 and 3 hitters did a masterful job setting the table for him in the seventh. Tsuyoshi Nishioka led off the frame against reliever Tetsuya Yamaguchi and singled to center. After a Hiroki Uemoto groundout, Takashi Toritani laced a double that bounced just inside the left-field line on the way to the outfield. Gomez strode to the plate with runners on second and third and drove a fastball, that was slightly up and in, into left field to bring home the tiebreaking runs. “I made an adjustment, got another good pitch and I’m just happy I could help the team win,” Gomez said. Yuya Ando earned the victory in relief, tossing 1 2/3 scoreless innings. Third-year Tigers right-hander Ryoma Matsuda allowed a pair of two-out hits in the eighth, bringing Wada out of the dugout with closer Oh Seung-hwan not far behind him. Oh retired Frederich Cepeda to end the eighth and got three more outs in the ninth to nail down the save. “Oh has been pitching so well, so I knew I could count on him to get a four-out save,” Wada said. The final out was one of the most memorable of the night. The Giants’ Yoshiyuki Kamei latched on to a fastball and sent it deep to left-center, where outfielder Yamato Maeda made a diving grab to end the game. It was the Tigers’ answer to the dazzling play Giants center fielder Hisayoshi Chono made earlier in the game, when the Tigers had the bases loaded. The Giants’ backs are fully against the wall now. After beginning the series with an automatic 1-0 advantage as the pennant winner, the Kyojin have lost all three games played on the field. 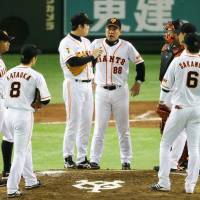 Giants fans can find solace in the 2012 final stage, when the Chunichi Dragons won the first three games, only to have Yomiuri win three straight and take the series. What they won’t be comforted by is how the Tigers have mostly been able to hold the Yomiuri offense in check for three games. The Tigers have bent but have rarely been broken during the series, holding the Giants to one run in the opener, two in Game 2, and two on Friday. 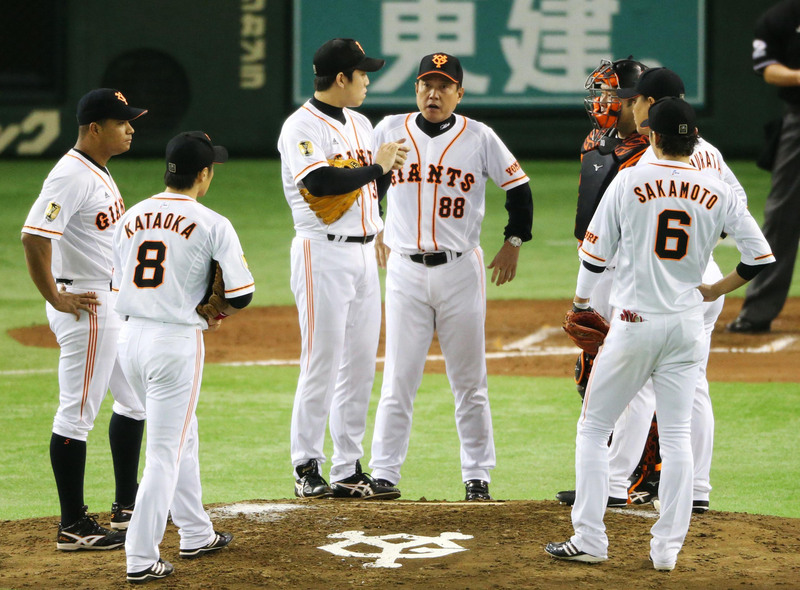 The Giants took their first lead of the series on an RBI single by Shinnosuke Abe in the bottom of the first. The lead was extended to 2-0 in the third, with Kamei taking starter Randy Messenger deep into the right-field stands. The Tigers clawed their way back in the sixth. Uemoto started the inning with a single, stole second and scored on a single by Gomez. Matt Murton sent Gomez to second with a base hit and a pinch-hit RBI double off the bat of Kosuke Fukudome made the score 2-2. Yamaguchi was charged with the loss after allowing a pair of runs in his one inning on the mound. The Tigers may have taken the lead earlier than they did if not for Chono’s play in the fourth. Uemoto and Gomez had each singled, and starter Toshiya Sugiuchi hit Murton with a pitch to load the bases with one out. Sugiuchi struck out Ryota Arai, but Akihito Fujii got his bat around a 2-2 fastball and drove it toward left-center. The ball hung just long enough for Chono to run underneath it, stretch out his left arm and save three runs with a great catch. It ended up being all for naught as Hanshin eventually tied the score in the sixth and went ahead in the seventh. Now the Giants will need a lot more big plays to avoid having their season end on Saturday. The Tigers will have games left to play regardless of the outcome, but they’re hoping their next contest will be at home to open the Japan Series on Oct. 25. Game 4 is scheduled for Saturday at Tokyo Dome with the first pitch slated for 6 p.m.
“We have an opportunity, that’s what we have in front of us,” Murton said. “Obviously we’re not done yet. When you go back and look, just in 2012 the same situation occurred and the Giants came back and won three straight.